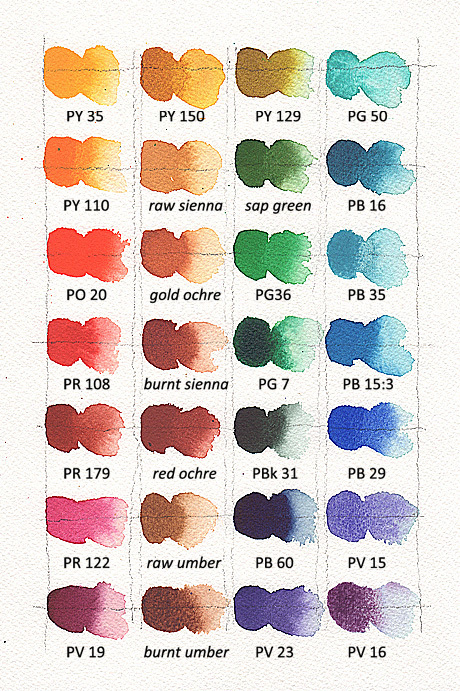 These are the paints in my 28 whole pan plein air paint kit. The ordering from top to bottom is by hue, although there are breaks in the ordering in the right two columns. The four columns exemplify hot, warm, neutral, cool. All the pigments are lightfast. What alternative paints are available? That depends on the column. There are many, many organic and inorganic pigments for warm spectrum hues in the first column; there are many color variations within the categories of "earth" pigments italicized in the second column; there are mostly convenience greens and dark neutrals to choose for the third column; each of the blue or violet pigments in the fourth column, and the limited alternatives we might put there instead (PB17, PB27, PB28, PB33, PB36, PB72, PV14, PV49), is unique.